Frost Ontroester / Rust remover 1 ltr. Frost Rust Remover iverwijderd efeectief roest van staal en ijzer. Veilig in gebruik op alle oppervlakken. Tast geen materialen aan, zoals koper, messing, aluminium, kunststof,rubber of vinyl. Niet giftig, niet brandbaar, biologisch afbreekbaar, bevat geen zuren, zouten of peutroleum oplossingen en is herbruikbaar. Verwijder vuil en vet van het onderdeel. spoel volledig of dompel het onderdeel voo 1-12 uur afhankelijk van diepte en leeftijd van de roest. 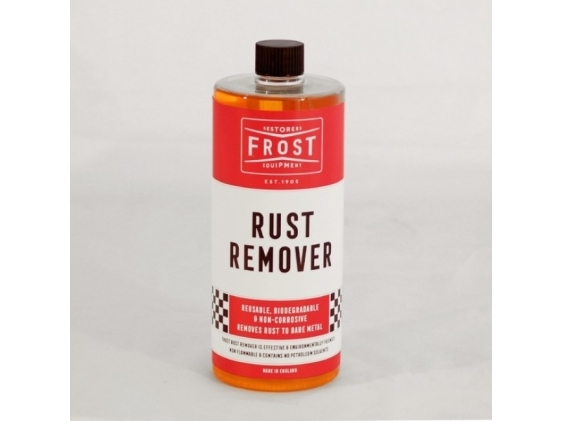 An amazing and environmentally friendly rust remover! Frost Rust Remover has been proven to effectively remove even deep rust from all types of mild steel and iron. It is safe on all surfaces and will not harm copper, brass aluminium, plastic, rubber or vinyl. It is non-toxic, non-flammable, biodegradable and contains no acids, alkalis or petroleum solvents. Simple to use with effective result. You can reuse Frost Rust Remover several times until its performance starts to deteriorate. It is safe for use in fuel tanks, spray cabinets, ultrasonic cleaners, pressure washers, pumps and vats. As well as being used for general rust application, Frost Rust Remover can be utilised to target deep rust from the entire cooling system. It uses the latest technology in rust and corrosion removal to completely revitalise automotive cooling systems. It removes rust scale and deposits from radiators, water pumps, water jackets, engine blocks, and heads. During Summer months rust can be just as much of a problem as rust and corrosion act as an insulator, causing vehicles to overheat. This product restores the engine's ability to transfer heat to the coolant allowing engines to run cooler and last longer. Contains non-toxic, non-corrosive and non-flammable ingredients meaning it will not harm or clog your engine. Available in 1L, 5L or 25L. Effectively remove even deep rust. Easy to use and reusable several times. Safe on all surfaces including Copper, Brass, Aluminium, Mild Steel and Iron. Step 1: Remove dirt and pre-clean item. Step 2: Rinse then completely immerse item in the solution for 1-12 hours depending on the depth and age of the rust. Step 3: Once rust is removed, rinse item well with water. *For fuel tank de-rusting: Completely fill the tank with Frost Rust Remover and rotate the tank every hour until the rust has been removed. Drain completely and rinse well with water. Air dry and fill with petrol immediately to eliminate flash rust.